News about Really Clear. Click here! Kids tend to grow up more than out. For this sweater, you will make the sleeves and hem extra long. You'll sew up the hem, and roll up the sleeve cuffs. When the child grows, the parents can snip the hem down and roll down the cuffs. And the sweater will magically fit once again! Sized for babies through age 10. You remember those days (they weren’t very long ago, after all): You left home, you made new friends, you studied, you learned what a party really was, you met your third true love, and on chilly days, you walked down College Avenue in a comfy sweater. This pattern is different from most other sweater patterns in that it is calculated for fit, particularly in the sleeves. No matter what body type you have, this sweater will fit you. The pattern gives help on length adjustments. On the sleeves it is specifically calculated to fit using an easy, fill-in table. It would be useful, although not completely necessary, to have cabled on another project before tackling this sweater. If you have never made a sweater before, you will probably need a friend or teacher to guide you through a section or two, as would be helpful for any first sweater. You’ve made a scarf, and you want to go on from there. Believe it or not, this sweater is the perfect next step. It is mainly rectangles. 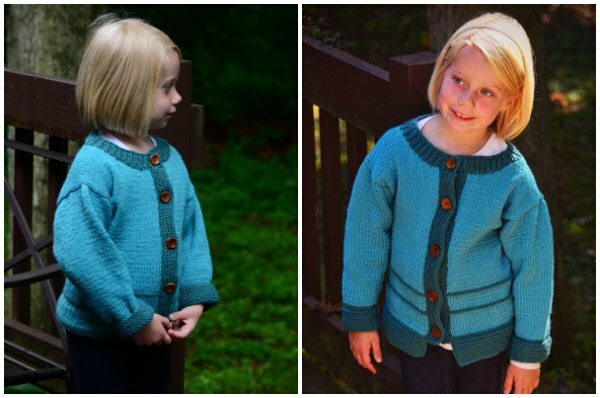 You can make it as either a pullover or a cardigan (the cardigan is shown here), and you can use any yarn you wish. I wear mine on the weekends when I want to be extra comfy. It’s terrific thrown over old jeans and a t-shirt! It is knit to fit you, so grab a tape measure and get going! 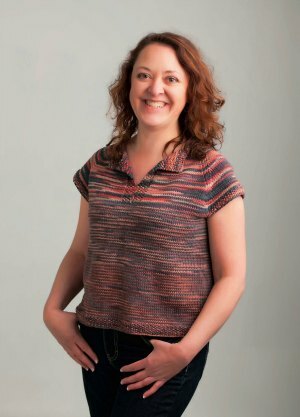 This knit-to-fit t-shirt is easy to make and easy to wear. 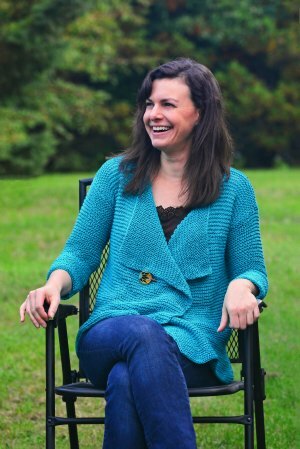 It walks you through a step-by-step process for making it any size, and it uses whatever yarn you choose. It’s a perfect first-sweater project! Instructions for both in-the-round and back-and-forth knitting. Simple instructions for figuring out fit based on gauge and the wearer’s size measurements. Instructions for mattress stitch and Kitchener stitch.